Underwater Welding Salary - The real Numbers - How much can you earn? Have you heard of that ridiculously high underwater welding salary? So have I. 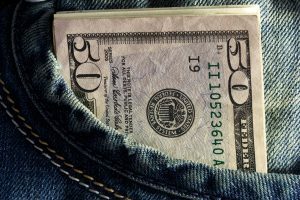 People claim to earn $300.000. But I wondered – is it real? Only a few people know how to weld. And only a few people have advanced skills in scuba diving. So there are even fewer people, who know how to dive and weld. And even fewer, that are professional underwater welders. And out of these, only a few make decent money. Of course, if you are familiar with one of the jobs, you can combine both occupations and start your career as an underwater welder. But how much do underwater welders make? Why is the salary of underwater welders higher? Luckily, several sources provide pay data. Let’s take a look at the real numbers provided by Payscale, AWS and the U.S. Bureau of Labor Statistics. Payscale notes that the median welder salary for underwater welders is around $65,500. 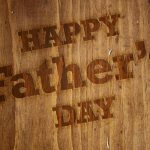 According to Payscale, 25% of underwater welders earn less than $48.000, 75% earn less than $100k and 90% earn less than $110k. (Source). Thus, you need to be one of the top best 10% of underwater welders to make a top salary of over $110.000. You can bet this is hard. In contrast to these numbers, the American Welding Society AWS states here, that underwater welder’s salaries range from $100.000 to $200,000. I could not find additional sources for the statement so far. In official employment statistics, underwater welders belong to the large group of commercial divers. When you take a look at the numbers which the U.S. Bureau of Labor Statistics mentions here for this group, the mean annual pay is $55.270 and 90% earn less than $96.850$ (as of May 2017). But why are there so huge differences in the pay rates? You will see it in the next chapter. 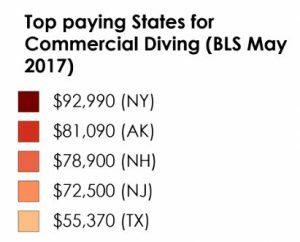 According to the U.S. Bureau of Labor statistics (May 2017), highest paying states for commercial divers were as follows. 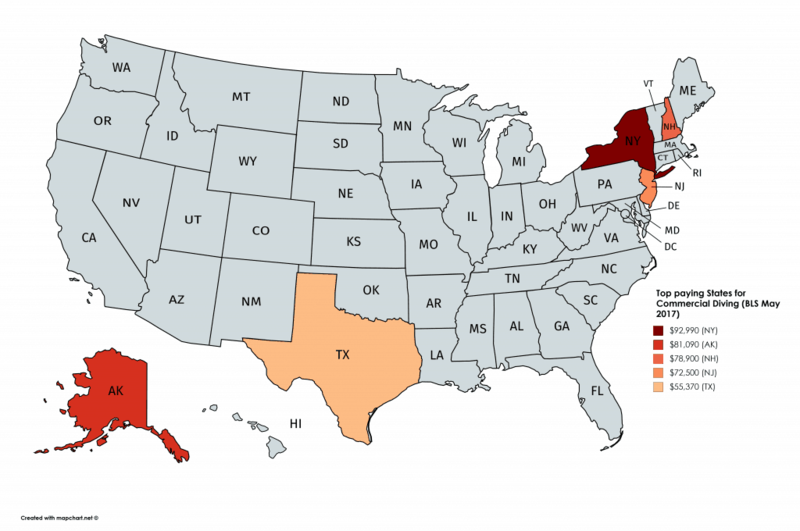 In the following map, I marked the areas with the highest paying jobs (where data was available – other states might have higher pay). As you can see, East Coast and Alaska are quite lucrative for commercial divers. 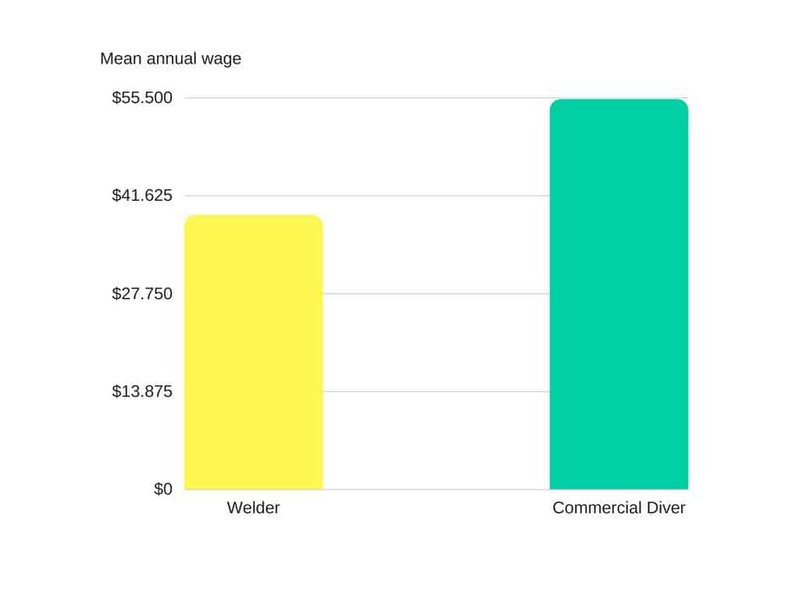 As you can see in the following chart, in May 2017, the mean annual wage of a commercial diver is over 40% higher than the mean annual wage of a professional welder. Professional welders include solderer and brazer, see BLS data here. 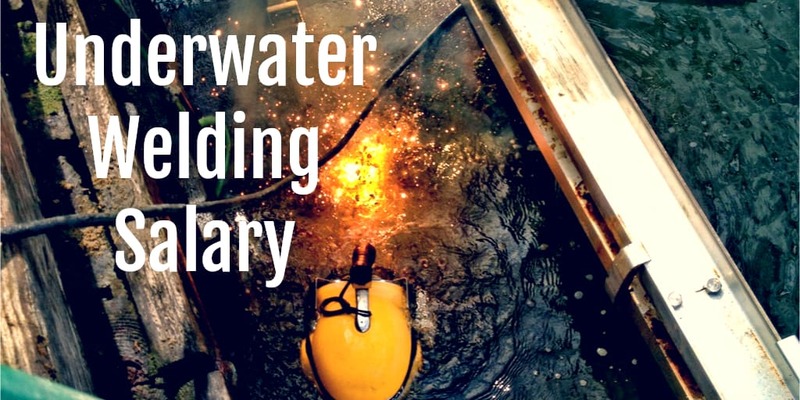 Full-time positions for underwater welders are very uncommon. Underwater welding jobs are given project-by-project. While you might have a high income for 3 months, it could be that you are looking for a new project for 3 months, earning zero. According to the U.S. Bureau of Labor Statistics, the job growth of commercial divers from 2014-2024 is expected to be 37%. Thus, the demand on commercial divers stays stable. On the downside, a career in welding usually requires a significant amount of travel involved. Underwater-welding is very dangerous but can be really profitable. You need a lot of training lessons and diving experience before you can start with real weld jobs underwater. Taking lessons in an underwater welding school is expensive, too. 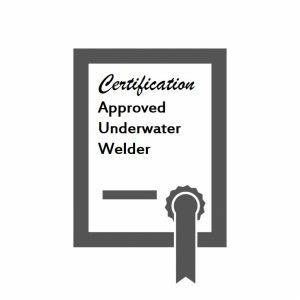 Moreover, an underwater welder needs certifications. Also, certifications require renewal regularly. In general, there are two different welding methods to weld underwater: Dry welding and wet welding. Dry welding means you are inside a pressure chamber filled with a gas miture sealed. This means, the structure you are welding is sealed against the water. When wet welding, you are submerged underwater and weld with waterproof welding electrodes that provide a current up to 400 amps of power. Thus an electrical shock could happen anytime if you make a mistake. Because of the implied dangers and requirements, underwater welding pay has to be higher than the pay of a “normal” weld job. Compared to welding equipment for standard welder, underwater welding equipment can be quite expensive. Of course, as an underwater welder and commercial diver you will not only weld underwater but also prepare materials. This means your job duties can include cutting, fitting and rigging material and transporting it to the job site. Usually you need to have the underwater welding specialist training program provided by the Commercial Diving Academy as well as the AWS D3.6 standard in welding skills. 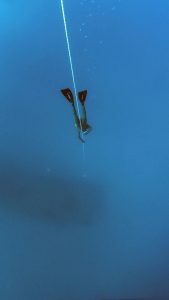 The Commercial Diving Academy (CDA) is the only diving school in the US that offers official and internationally accepted training for underwater welding specialists. Underwater welders are commercial divers who help construct underwater infrastructures or repair ships. All while wearing a pressurized dive suit. If you take a job in this field, not only might you weld, but you could also cut, fit and rig materials before lowering the material to a job site. Experienced and skilled underwater divers also get the role of the project manager who plans the jobs. Very often, underwater welders get jobs that must be finished in no time. Thus 60-hour work weeks are not uncommon. Of course, overtime is expensive. It is a usual practice that hourly pay increases by 50% for overtime hours. In summer there are heavy work seasons where underwater welders can bank hard. But in winter, jobs will get in rarely and there can be months in which you won’t earn much. 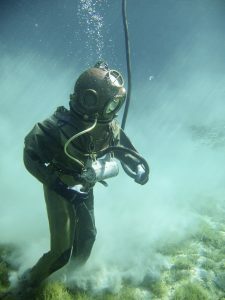 Saturation divers also get paid by the depth of the dive. 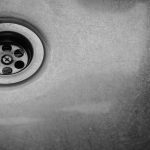 The depth pay is usually $1.00 per ft. minimum. Depth pay usually counts for the first 100 ft. and then multiplies. That means for a depth of 50-100 ft. the pay is $1.00 per foot. Then at a depth of 101-200 ft. it is $2.00 per foot. Then at 201-300 ft. it is $3.00 per foot and so on. This is just an example. Exact depth pay varies depending on the dive location and industry. But as you can see, the deeper the dive, the more lucrative is your job. Think of a dive in 300 ft., this is $3.00*300 = $900 only for the depth pay alone! Now you see, why some marine welders can earn so much. As said, underwater welding is dangerous. Thus, it is not uncommon for veterans, ex-military and adventurer seeking more than a standard nine-to-five job. I want to learn more!! !